Arsenal legend Ray Parlour has revealed the key details that impressed him after watching training sessions led by new Gunners manager Unai Emery. The Spanish tactician is really under the spotlight this season after taking on the daunting task of replacing Arsene Wenger at the Emirates Stadium. The legendary Frenchman stepped down after 22 years at the end of last season, and it seems Emery could bring a very different approach to managing Arsenal. Parlour certainly seems to like what’s seen so far, despite the north Londoners losing their first two games of the new Premier League season. 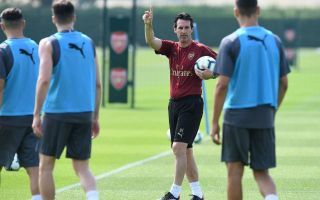 In fairness, Emery was handed a nightmare start with fixtures against Manchester City and Chelsea coming up first, but Parlour seems to think there’s cause for optimism after seeing the demanding nature of the former Sevilla boss’ training sessions, explaining his attention to detail and one-on-one talks with players in the pursuit of perfection. ‘I watched Emery in training and I was impressed. It was very, very intense. He is right into the players, demanding high standards, every single pass has got to be right,’ the former midfielder is quoted in the Metro. ‘He was going one-on-one with players, trying to tell them what he wants. But it will take time.